Bowl, flaring with a small foot. Brown stoneware with dark brown and white glaze. 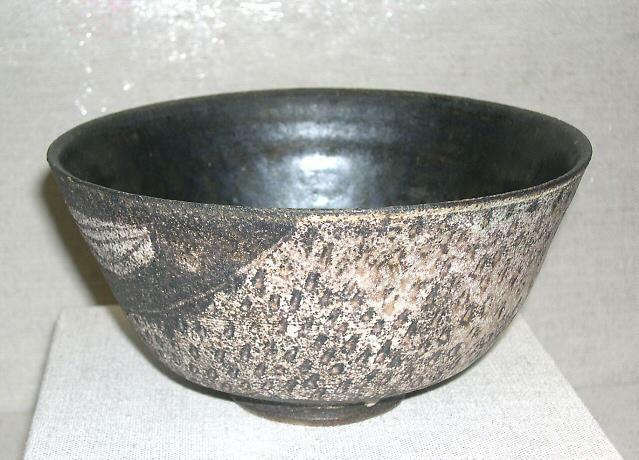 Interior has a beautiful dark green glaze with black. Decoration consists of a curving form in white (looking as if wind was sweeping dust or snow); a leaf with veins; a rectangular shape, enclosing a circle, cut into two parts forming a crescent moon in one half. Wildenhain collector Forrest Merril suggested that the piece may have been made when Wildenhain lived in Holland in the early 1940s and used this particular green glaze.